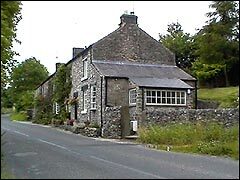 For our 1999 holiday we booked a cosy cottage in a small village called Litton in the Peak District National Park in Derbyshire. 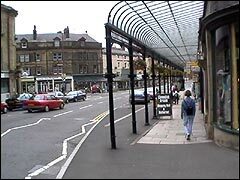 From there we visited Buxton, the Blue John Cavern near Edale and did the Coronation Street tour in Manchester. 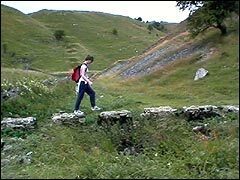 And in a car-free day we enjoyed a local walk in the Derbyshire Dales from the holiday cottage. Here's our lovely little stone cottage for the week in Litton and conveniently located near to Buxton and all the places we planned to visit in Derbyshire. On the first day we went into Buxton, a spa town famous for well dressing, and the lovely Pavilion Gardens. That's Belinda off down the main street. 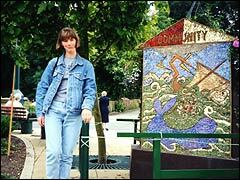 Well dressings take place in most villages in the Peak District National Park during the summer and attracts many visitors, as did this one in Buxton. In Buxton's Pavilion Gardens the map here is artistically constructed out of flowers. The gardens had a large lake for boating and a miniature railway trundling around it. 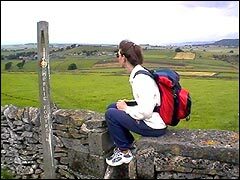 Please visit our tourist links page for Peak District websites you'll probably find useful if planning a visit to Derbyshire's Peak District. In the afternoon we moved on to the Blue John Cavern near Edale and Castleton in the Winnats Pass limestone gorge; and a chance to admire this fantastic view of the Derbyshire countryside. Our guided tour of the Blue John Cavern started with a steep stepped descent into the cavern and lasted around 40 minutes, during which we admired the many attractively lit rock formations. 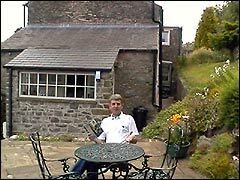 On the second day of our Peak District holiday we sat outside the stone cottage and checked the guide book prior to our drive to Manchester for the Granada Studios Coronation Street tour. At Granada Studios we enjoyed the helpful guide's presentation and learnt all about TV programme production. 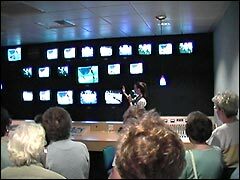 Here we saw how the Coronation Street soap is produced and edited. This is the famous Weatherfield Coronation Street cobbles, the very one seen in the soap which we were able to wander along. Of course the buildings are just frontage with interior scenes shot in the studio. 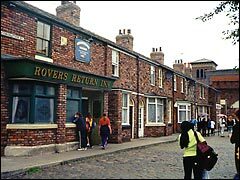 The Rovers Return is the place where most of the interactions (read: affairs, rows, fights, business deals) take place in Coronation Street. As you can see, it was rather swamped by tourists! ...rain eased we ventured out for a local walk from Litton and enjoyed some lovely Peak District countryside, here looking towards Cressbrook. Mike's unfortunate encounter with a rather large moth flying down his T-shirt during our picnic lunch prompted some rather odd behavior when he tried to kick down a dry stone wall! Ouch! The guide book called this a seasonal river, but it was dry (summer season) so we didn't really need to use the stepping stones provided, but hey, what the heck, let's use them anyway! 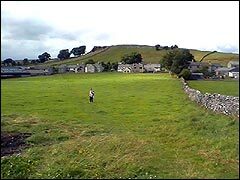 Back towards Litton and the Peak District holiday cottage then, and a quick shower and change before visiting the pub for an evening meal at the Red Lion. 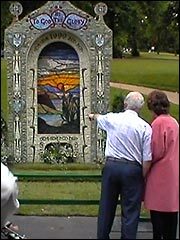 Peak District and Derbyshire web links to the places we've visited are on our tourist resources page. 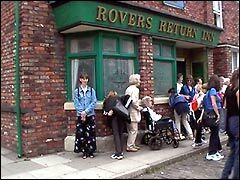 Note: Coronation Street is no longer open to the public as a visitor attraction. 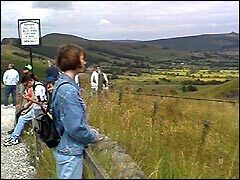 Now please proceed to the next page of our Peak District holiday where we visit Alton Towers and do some more walks - visiting three ships around Baslow and another through Monsal Dale. Oh our poor feet! 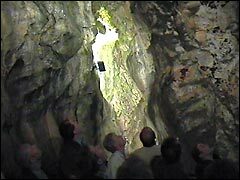 We've also got underground at Geevor Tin Mine in Cornwall and you may like to view our Yorkshire holiday section. Much more recently we've done the Harry Potter themed Warner Bros. Studio Tour.